Time of day call routing is very much required either you use a contact center environment or non contact center environment. If you are not using CC environment, you can do Time of Day cal routing using Cisco Unified Communications Manager or Cisco Unity Connection. If you use CC environment, life becomes easier and the calls are handled efficiently. Accept > Play Company welcome greeting > Check time > If falls within business hours, route the call to a Queue else Play a closed hours greetings and disconnect the call. 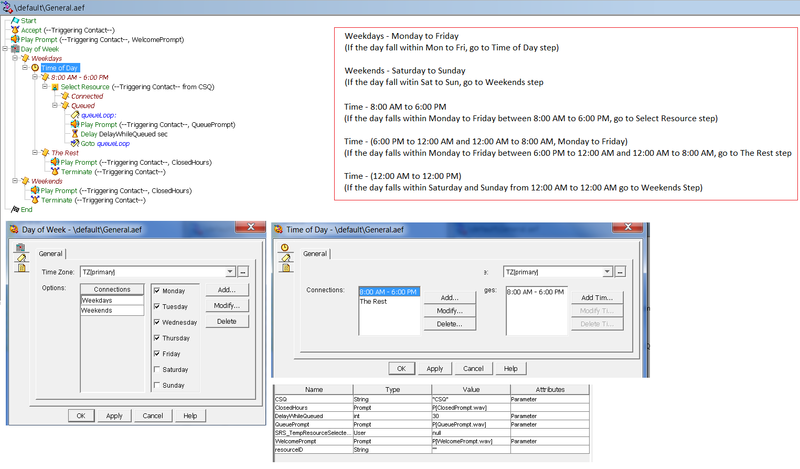 To configure a simple time of day call routing we can create a very simple script which does its job efficiently. Please click here to download the script. I have a smilar cases as follows. I have created a script for you but however i have not tested this in lab but it should work as expected. Let me know if you face any issues.